Recently it seems as though our world, our morals, our values are all playing tug-of-war with the devil. When we watch movies or cartoons where the villain turns people against each other and then sits in the corner and laughs, we automatically hate the villain. Even Hallmark movies have villains who try to cause problems and stir up trouble disguised as good guys, but we viewers always dislike that troublemaker and cheer on the good guy to win the designated race or get the business or get the girl! As I watch all the division and destruction and outright disrespect of people in this country, I can’t help but visualize the devil sitting in the corner, arms folded behind his head, propped back all cocky with a devious grin on his face. He loves the tug-of-war this world is playing. This one pulls hard to the right. Then this one pulls hard to the left. Each side tries to get the strongest and biggest people on their side in order to pull harder. I’m not just talking politics and I am NOT writing blogs of any political content. I am talking about the tug-of-war of good versus evil. I’m talking about how we have lost of sight of people and love and showing respect to others. Jesus tells us that we only have two jobs in this whole world and that is to love the Lord your God with all your heart and with all your soul and with all your mind and to love your neighbor as yourself. (Matthew 22:37-39). Yes because of these two commands we have a lot of other jobs to do but everything in life should be based around these two things and the love of Christ would permeate this world beyond belief and this tug-of-war would end. I beg you today to be the one to lay down your end of the rope and walk away from the tug-of-war with evil. Instead love your neighbor, help your co-worker, kiss your kids, have dinner with your spouse and look for ways to show kindness and the love of Christ around the world. Just start with one act of love and watch it grow. 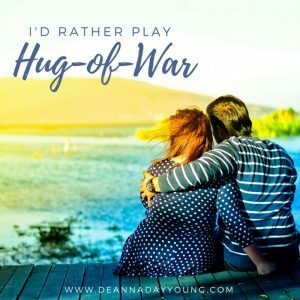 Yes, I would rather play “hug-of-war” than tug-of-war any ole day! This entry was posted on October 10, 2017 with tags: #deannadayyoung, #kindnessmatters, #makeadifferenceeveryday by Deanna Young.